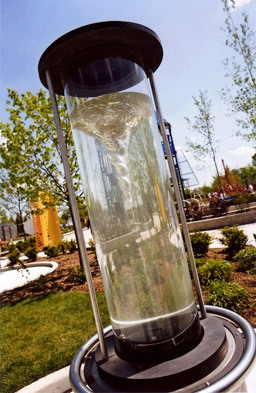 Create and observe a large vortex in an enclosed column of water. Rotate an exterior crank to activate a turbine (fan-like device) at the bottom of the water column. Movement of the turbine creates a vortex of water that changes with the speed of the crank. The water is set in circular motion by the turbine. As the water is pushed up the cylinder wall, its rotational speed slows. The difference in speed between the water in the center and the water on the outside is what creates the amazing, distinctive vortex shape. Tornadoes in air and whirlpools in water are both examples of vortexes. Tornadoes and whirlpools, because of their tremendous power and destructive capacity, have long inspired both fear and fascination. But fascinating though they might be, tornadoes and whirlpools are natural phenomena, and we inspect them closely at our own risk. However, there are some places where it’s safe to observe vortexes: the bathroom. Think of a sink draining or a toilet flushing; both those actions create a vortex of water.